Never afraid to stand out from the crowd and stand up for what’s right, we search the world for the finest ethically-sourced ingredients to create a range of naturally-inspired beauty products. Today our dedication to business as a force for good is stronger than ever. 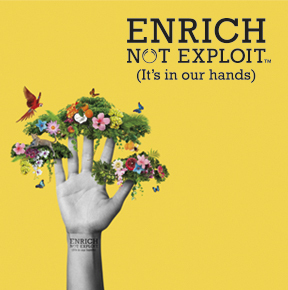 As part of our Enrich Not Exploit™ Commitment, we’ve made it our mission to enrich our products, our people and our planet. That means working fairly with our farmers and suppliers and helping communities thrive through our Community Trade programme, being 100% vegetarian and always and forever being firmly against animal testing. Together we can do it, it’s in our hands. We’re 20% of the way to meeting our Bio-Bridges goal! In 2016, The Body Shop embarked on a wild challenge to raise funds to build Bio-Bridges, protecting and regenerating habitat to help endangered wildlife around the world. We’re so proud that because of our passionate customers we’ve raised funds to build an incredible 17.2 million square metres of Bio-Bridges in 2016, which, at the size of more than 2,500 football fields is more than 20% of our 2020 goal to protect 75 million square metres! Over 5 million square metres worth of these funds were raised during the festive season alone. We cannot thank you enough. By making selected purchases at The Body Shop during our Bio-Bridges programme promotions, our customers were directly helping build Bio-Bridges, through donations from these purchases by participating The Body Shop stores. These funds will help improve endangered animals like Reggie the Red-shanked Douc, who is one of the species in Vietnam we are aiming to help protect. Bio-Bridges is an important programme which aims to regenerate wildlife corridors within damaged landscapes to help endangered species reconnect and local communities to live more sustainably. Our partners on this project in 2016 were World Land Trust (WLT) and VietNature in Vietnam, the Orangutan Land Trust in Indonesia and Wildlife Conservation Society in Malaysia. But The Body Shop’s commitment to protecting wildlife doesn’t stop there. By 2020, we will protect and regenerate 75 million square metres of habitat. Having launched our Enrich Not Exploit™ Commitment in February 2016, we have mobilised The Body Shop global family around a new aim of true sustainability. Many of us at The Body Shop worked directly with our founder, Anita Roddick, and the Commitment is not only inspired by her fundamental belief that business can be a force for good, but also by the company’s thinking around sustainability in the 1990s. To deliver this ambitious aim of true sustainability we need to think differently and more radically and creatively than before across the full range of our activities, including our philanthropic efforts. To that end, we invited The Body Shop Foundation to work with us in a new way. Unfortunately, the Trustees declined our offer so, sadly, we accepted that decision. To ensure our philanthropic activities remain a fundamental part of the business, we will be launching a new The Body Shop Foundation in 2017. We have been proud to fund, support and raise awareness for The Body Shop Foundation’s work over the past 27 years. It has made a fantastic and lasting contribution to many wonderful charitable causes, donating over £24 million to more than 2,600 groups, projects and issues. Over the years, countless numbers of our employees have donated their time, energy and effort to support the Foundation’s activities through volunteering. We have been inspired by the Foundation and all who have worked in its dedicated team. We wish them all the very best for the future.